Destination Health is a new HKS Stories series that explores the impact and role that design and design thinking has on our health and well-being. Read the first installment here: What is the Hospital of the Future? Perhaps not a Hospital at all. In this second installment, we share a blogpost by Shannon Kraus based on a TedX Talk he delivered in Plano, Texas, in April 2017. As an architect and strategic thinker, my career is largely devoted to designing buildings and places intended to improve the well-being of others. A career focused on design constantly challenges me to understand different perspectives on the issues we face. So today, at a time when we seem to be more socially divisive and isolated, I hope to shift your perspective. I want you to think about impacts on our health, the importance of community, and about the role of design in addressing this challenge. In the U.S., we spend more annually on health care than any other country in the world, yet we are last in health by almost any measure. We rank 39th for infant mortality and 36th for life expectancy, to name just two. When you look at the headlines, much our attention is focused on health care coverage and its rising costs. But what if we are approaching the problem from the wrong perspective? What if I told you that just 20 percent of your health and well-being is attributable directly to your access to, and quality of, health care? The remaining 80 percent is attributed to socioeconomic, environmental and behavioral factors such as poor housing, diet and exercise. Factors that trigger a sharp rise in preventable chronic diseases, like obesity and diabetes, also affect health; factors that are tied both directly and indirectly to where and how we live. Case in point. Roseto, a small rural town in eastern Pennsylvania, was mostly an Italian immigrant community, named for a similar city in Italy that featured closely spaced houses and walkable streets. In the 1960s, Roseto’s heart disease rate was nearly half that of neighboring Pennsylvania towns with a similar mix of residents. They didn’t have a single death under the age of 45 due to heart disease and men were living so much longer that Roseto had more widowers than widows. They worked in stone mines, drank wine in abundance, smoked habitually, and ate fried foods. They did all the things that health professionals warn against, and yet they lived longer. Why? Researchers reviewed death records and studied Roseto’s social fabric, ultimately concluding that its residents were healthier because they weren’t overly stressed. They were less stressed because residents in this close-knit community looked out for one another, pitching in to care for other people’s kids or sick family members. There wasn’t a social hierarchy or a “keeping up with the Jones’s” mentality. In short, they dealt with stress in a healthy way, interdependently. But researchers also made a prediction: within a generation—as suburbs expanded, houses grew larger, and fences were erected—social and economic isolationism would set in and the town’s people would divide, stress would rise, and health would decline. Researchers went back in 1990s and found this to be true. Today, Roseto has the same heart disease rates and life expectancy as anywhere in the U.S. Unfortunately, our modern lifestyle is dependent on cars. We move our bodies less, eat more and eat less healthily. Children walk or ride a bike to school 50 percent less than they did 30 years ago, dropping from 60 percent to just 10 percent. We’ve identified many lower income neighborhoods as “Food Deserts” in which fresh produce is scarce and fast food is prevalent. Over the last 60 years, we’ve replaced tight-knit neighborhoods with car-oriented suburbs that limit healthy behavior and may even discourage it. Our stress has never been higher—and we haven’t even touched on the topic of how stress impacts our mental health. That’s a blogpost for another day. The solution does not rest solely in improving delivery of health care, it rests in delivering healthier communities. Imagine if we could harness even a tiny percentage of the effort underway with health care reform to reinvest in how and where we live. Today we design ‘green buildings’ to be resource and energy efficient—to do less harm. To in effect be less bad. But what if we start designing buildings to promote health? This is where the opportunity for change lies. This is not only possible, it’s happening—and in areas you wouldn’t necessarily expect; regions with limited resources, low skilled labor and essentially no reliable infrastructure. Kachumbala, Uganda, is a rural village in the Bukedea District of eastern Africa. Its population of 50,000 is one of the country’s most impoverished regions. The average wage is $2.00 a day. Life expectancy is 13 years below the global average at 59, and its infant mortality is one of the world’s highest with 38 in 1,000 babies dying before their first birthday. Some of this is due to a need for more skilled nursing, and much can be attributed to aging, inadequate facilities and community infrastructure. Expectant mothers are turned away due to capacity issues after traveling long distances, either on foot or on the back of a motorbike taxi. Many won’t make the trip, choosing instead to give birth at home without medical assistance or sterile equipment. Clearly a new building and delivery suites were needed — but designed in a way that would be embraced by the village. With a lack of reliable infrastructure such as power and water, and a scarcity of materials to build with, a sustainable design was not an option — it was absolute. To help with unemployment, 40 community members were trained in regional construction techniques such as making mud bricks by hand. However, the training is not limited to construction workers. Midwives are being trained by other midwifes to handle pre-term births. These newly skilled tradesmen and midwives illustrate how a single project has positively affected the trajectory of their community, starting with expectant mothers, but extending to construction workers who can now afford an education for their kids. They didn’t just construct a building, they leveraged design to help shape the health of a community. An example closer to home is the Urban Food Studio. In Washington D.C., the Capital Area Food Bank provides leadership, education, training and food to over 400 partner agencies. About 16 percent of the D.C. region’s population struggles with access to food, with many purchasing inexpensive, unhealthy food as a coping strategy for hunger. CAFB realized that improving access to nutrition had to be more than just handing out food. They launched a demonstration garden for nutrition education and gardening basics, expanding the garden to increase capacity. 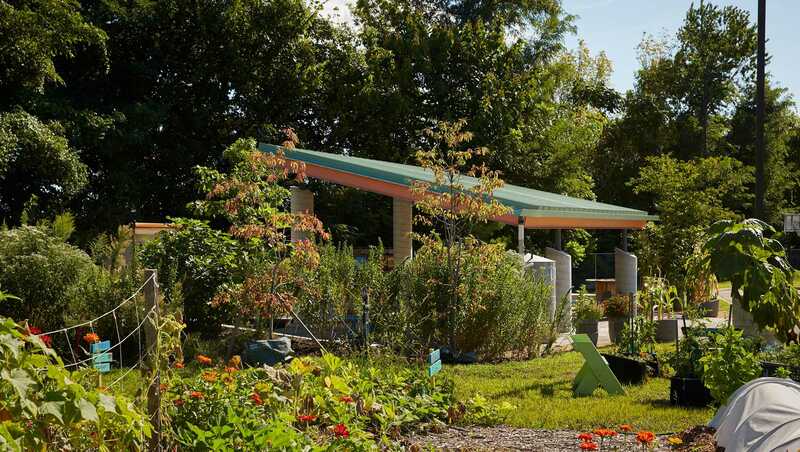 The multi-purpose garden—an ‘Urban Food Studio’—provides an all-season space for cooking classes, workshops and more. The studio teaches individuals and families that whether you have a back yard or a balcony, you can learn how to grow food and stretch food budgets. The result is a place that empowers healthy choices while improving access to nutritious food. In Kachumbala and D.C., both Citizen HKS projects, they started with the passion of an individual. In Kachumbala, it was a volunteer who sat with community leaders to discuss their most pressing issues. For the Urban Food Studio, it was a person with a passion for sustainable design who volunteers on her own time with the foodbank. She discovered they needed expanded space, then leveraged her network to help bring the project to life. Both volunteers donated their time and used design thinking to help solve communal and societal problems. When we talk about design thinking, we are talking about an iterative method for the practical, creative resolution of problems. But the real impact in design thinking is the ripple effect. Like a pebble in a pond, design-thinking isn’t just about solving the initial concern, it’s about the ripples—the impact beyond the initial idea being considered. With Kachumbala, the ripple effect of new delivery rooms was improving skilled labor and enhancing sustainability. With the Urban Food Studio, the ripple effect was about inspiring people to grow their own food and eating healthier. Whether we live in rural, urban or areas in between, we can—and must—come together to improve the health of our communities. At HKS, we do this by thinking beyond the property lines of clients to understand how buildings create neighborhoods, how neighborhoods shape place, and how place influences behavior. But you don’t need to be an architect, designer, or health professional to act as a catalyst for change. I believe design as a way of problem solving is in all of us. A single caring person can have a ripple effect and make a profound impact. Each of us shape the communities where we live by how we choose to engage with them—or choose not to. To do this sort of design-thinking yourself, you simply need to observe, engage and collaborate. Open your mind to challenges that you see in your neighborhoods, towns and schools. Engage with groups focused on challenges and ask where you might contribute. The solution doesn’t rest alone on Capitol Hill, where the focus is on the 20 percent. Nor is it in our own isolated political echo chambers. It’s in our hearts and shared humanity. Through design thinking we can create ripples and influence the 80 percent of our health and well-being that we control. It’s where we can recapture what Roseto lost, and what Kachumbala gained. Shannon Kraus is an architect who believes that design should improve community health and well-being. He advises clients on design strategies that lead to positive outcomes for the communities they serve.